A few weeks ago, my aunt and I went on a 10-day trip to Mallorca, a Spanish island in the Mediterranean. We'd been talking about doing a trip together basically since I started my business four years ago, so when she found round trip tickets to the island for less than $500, we finally got to travel together. I didn't know much about Mallorca when we booked the trip. Mediterranean island. Tapas. I was sold. Turns out there was a lot more to do than I expected. I'm not really one for laying out at the beach all day, so what I loved about Mallorca was that there was a lot of cute little mountain towns to wander, amazing places to eat, and really fascinating history to explore. But at the same time, there wasn't SO much to do and see that I felt like we had to take a rushed pace to see everything. If we wanted to stop at a cafe and enjoy some people watching and wine for a couple hours, we didn't like we were missing something. 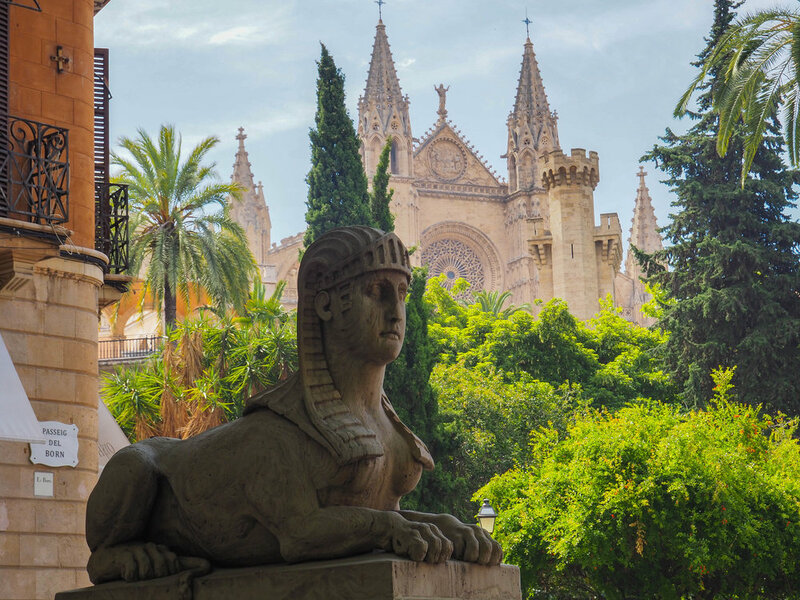 On our trip, we spent three nights in Palma, the main city in Mallorca, followed by four nights in Soller, a mountain town in the west coast. Then we came back to Palma and stayed near the the port for our last three nights. 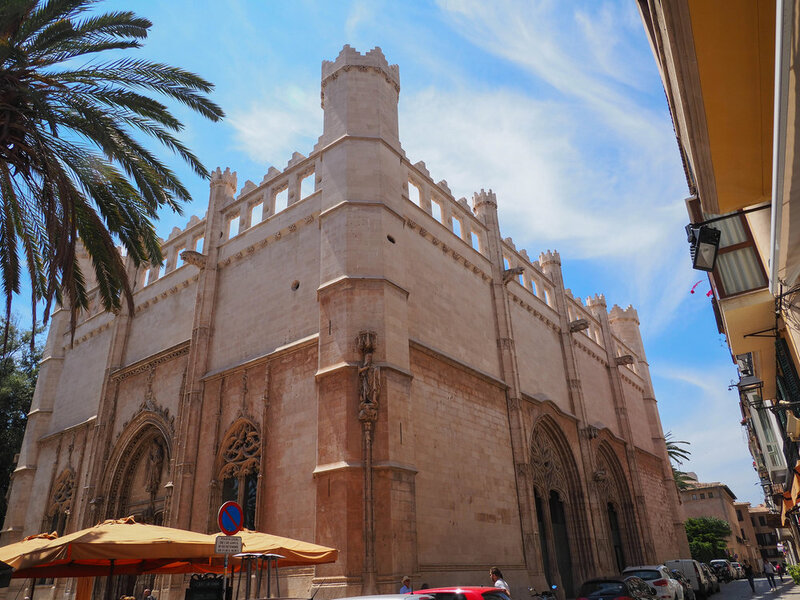 If you're planning a trip, here's some of my favorite things to do in Mallorca. 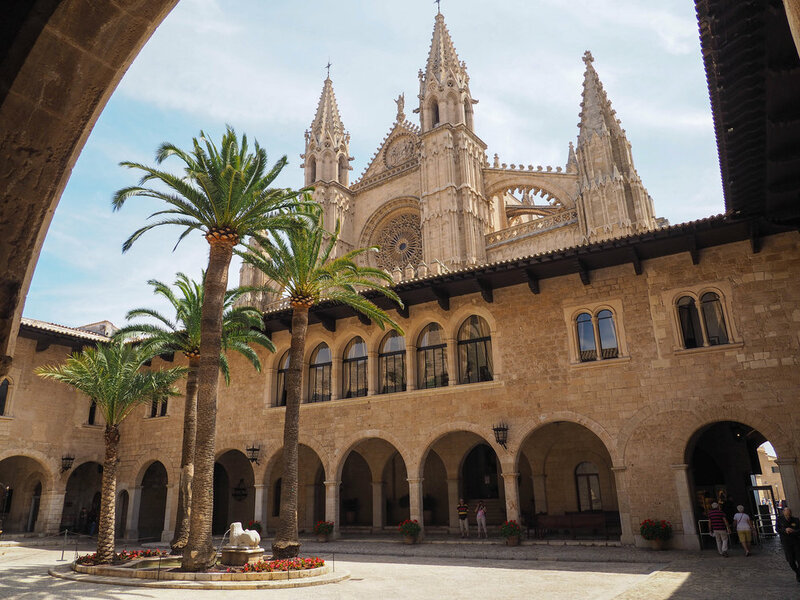 Palma has a really fascinating history. It was originally one of the two Roman cities on the island, founded in the 2C. About 800 years later, it was taken over by the Moors, then the Catalans. 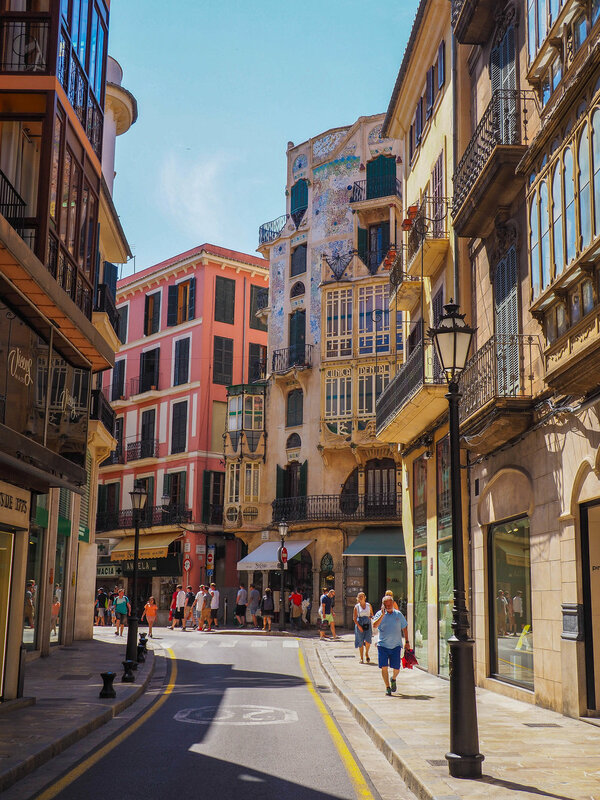 There's buildings and ruins from all those times scattered throughout Palma's city center, along with more recent modernist and art nouveau buildings. 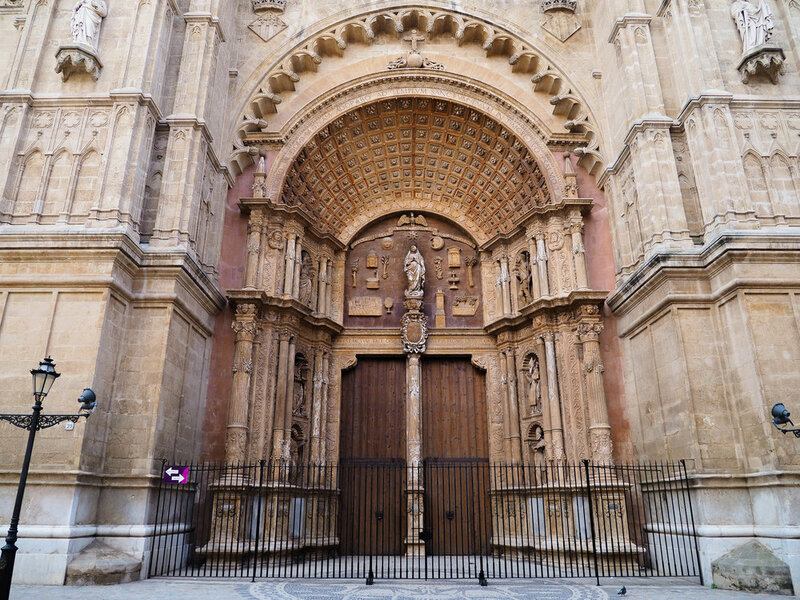 The historical center is a maze of narrow, winding streets that lead to pretty little cafe-lined plazas and massive stone cathedrals. 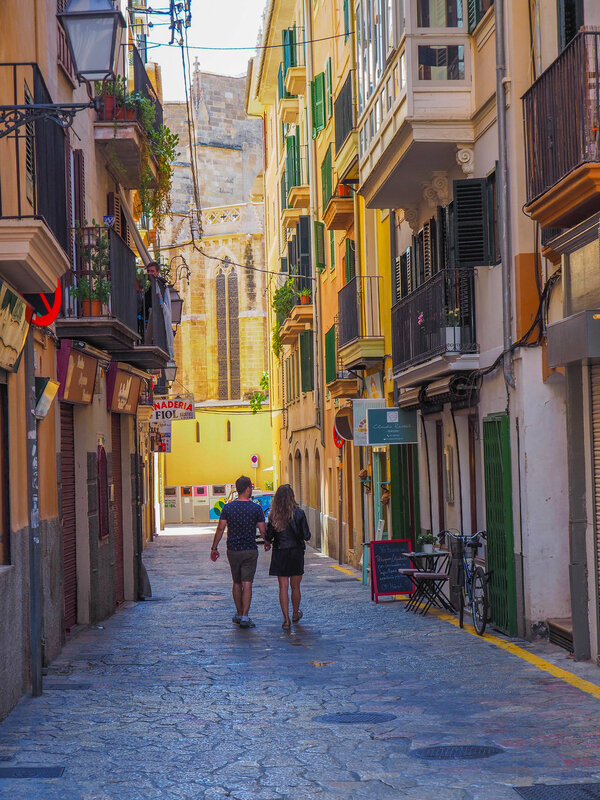 Most of Mallorca's main sites are in the old town, but it's also fun to just wander with no destination in mind. Don't be afraid to peer inside any glass doors, where you'll see the gorgeous courtyards of 17th century mansions. One of the most stunning cathedrals I've ever visited. If you go, try to get there early, not just to beat the crowds but also to enjoy a light show from the sun streaming through the stained glass windows. The highlight for me was Chapel of the Holy Sacrament, a recent addition built in the early 2000s by a famous Mallorcan contemporary artist. It's so different from the rest of the gothic cathedral, but somehow it just works. It feels like you're in an ancient cave! I also loved the hanging Gaudi alterpiece that's supposed to look like a crown of thorns. Next to the cathedral is the Royal Palace l'Almudaina. 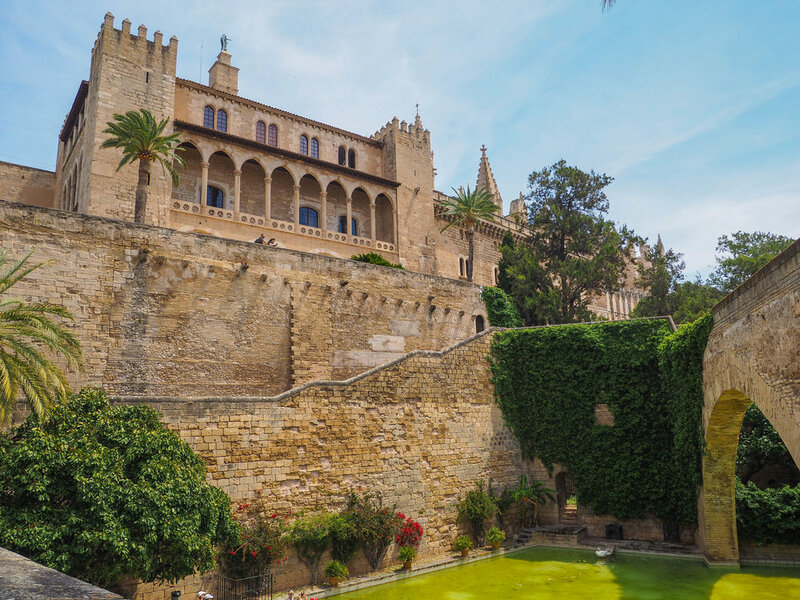 It was built on the original Muslim alcazar for King James of Mallorca. We took a tour of the inside (part of it is still in use as the official summer residence of the King of Spain, but the other part is open for tours), and even though it's scantly furnished, it was really fascinating to think about what it must have been like. I was obsessed with the views of the cathedral from the main courtyard. 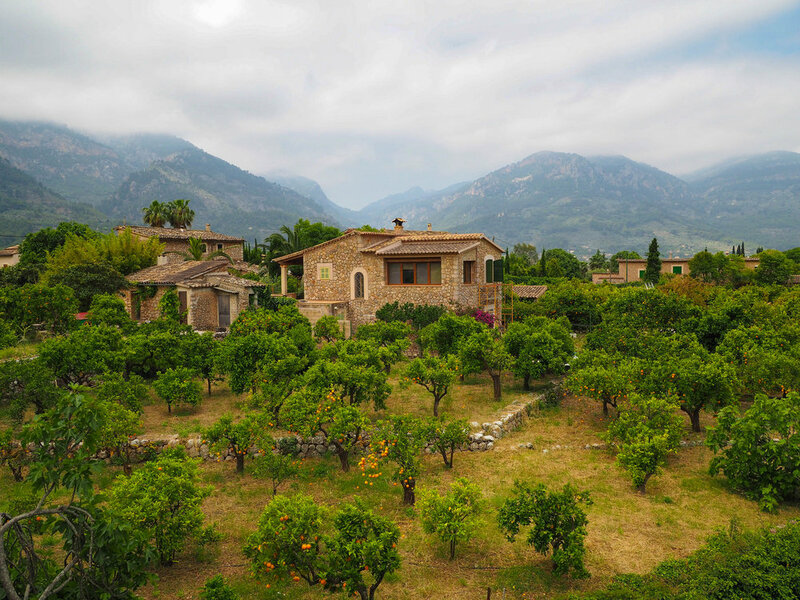 There's something about Mallorca that seems to attract artists, writers and other creatives. 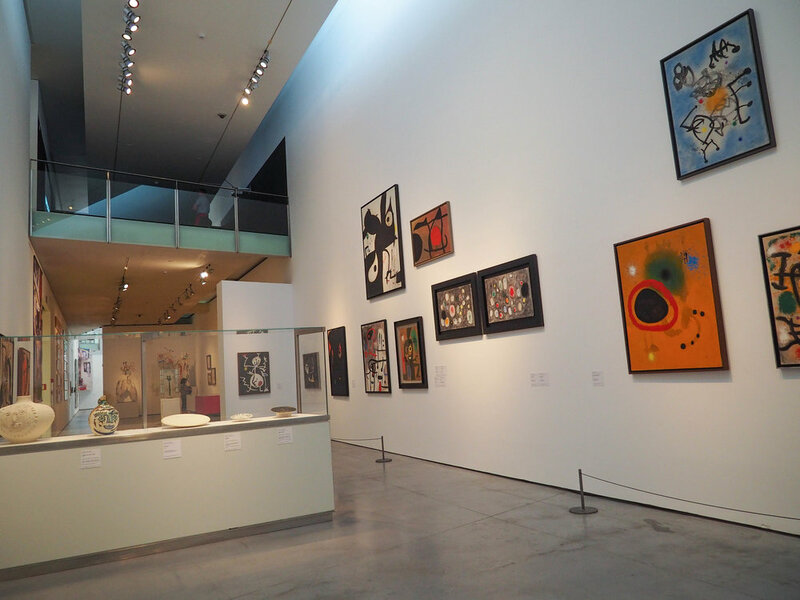 Picasso and Dali both spent time on the island, and there also Joan Miro, the most famous Mallorcan artist. If you're into surrealist art (I am), you'll love the art museums in Palma. My favorite was Fundacion Bartolome March, which was built in Palau March, the palace of the wealthiest family in Mallorca. The courtyard was filled with gorgeous sculptures. Inside, you could tour the palace while checking out exhibits by Dali, as well as this insane 17C 2,000 piece nativity set from Naples. We also visited Es Baluard, the modern art museum which is built into an 11C Islamic fort. Don't miss the views of Palma from the roof. Please do miss any exhibits by Bernardi Roig. I'm still having nightmares from his exhibit, which I'm pretty sure inspired the Saw series. It's also worth popping into Museu Fundación Juan March (it's free! ), a modern art museum built into a gorgeous 17C mansion. After taking a break from the rain and drinking rose and vermut in a food hall afternoon, we decided to hike a couple miles uphill to Bellver Castle. My aunt was thrilled with me for that idea. It's one of the few circular castles in Europe and it sits atop a hill that gives you incredible views of Old Palma below. If you're into history and archeology (hi again), there's some really interesting exhibits inside on the history of the castle when it was used as a political prison, famous Mallorcans, and the history of Palma. Our last day we spent just lounging by the beach. 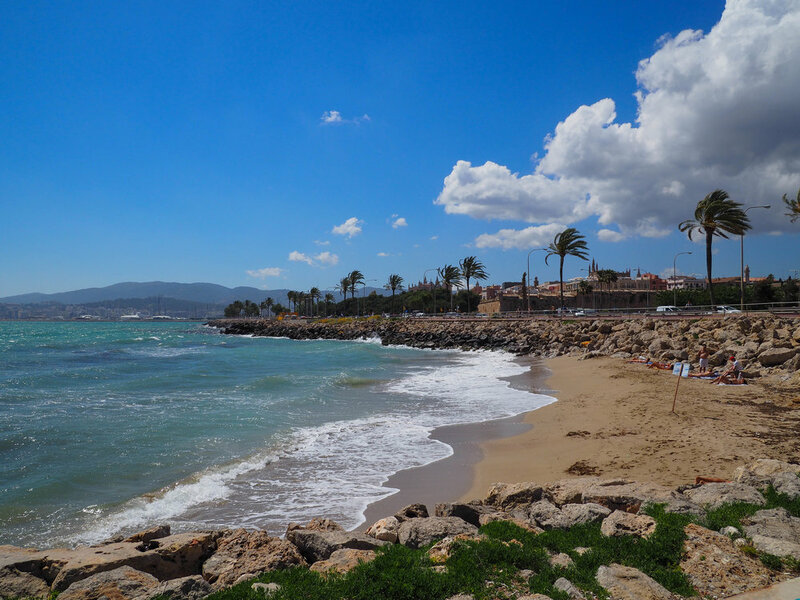 There's some really gorgeous white sand beaches further outside of town (Es Trenc is the one we heard the most about), but we just kept it easy and strolled along the port to the public beach that's just past the east side of Parc de la Mer. The water was a little...seaweed-y...but it was also just a little chilly for getting in, so the spot was just fine for napping on a chair and reading a book. From Palma, you can take an old fashioned train to Soller, a gorgeous little mountain town where we stayed for four nights. The track winds through orange orchards and up through the mountains. The wooden train is decorated with art by Miro, and both the stations in Palma and Soller have small art museums with more art by Miro and Piscasso. Like, what kind of train station has a bunch of Picasso pieces just hanging around? Try to go around noon when it isn't so crowded, especially if you have baggage, and get a seat on the left side for the best views. Where to Stay in Palma: The first three nights we were in Palma we stayed at HM Balanguera, this really cool modern hotel that's just a 10-15 minute walk from old town. When we came back to Palma for the last three nights, we stayed at Hotel Feliz which is about a mile outside of old town near the water. It was such a cool hotel, with a glass sided pool at the entrance plus another rooftop pool with views of Palma, and we had our own little private balcony with views of Bellver castle across the hallway from our room. Both had the most incredible breakfast included (local cheeses and sausage, crusty bread, sauteed veggies, creamy scrambled eggs, fresh fruit....basically how I want to eat for every meal). This gorgeous church in the main city square was redone in the early 1900s by a student of Gaudi with a modernist facade. It's really fascinating, because when you look at it initially, it looks like a traditional gothic church, but then when you pay attention to the details, you notice all the modernist touches. Highly recommend grabbing a glass of cava at one of the cafes in the main plaza, watching kids play soccer, and enjoying the view of the church. Soller beach and port is about 2 miles outside of town, and there's an old fashioned trolly that runs straight through the center of town that takes you down there. It's really popular with British and German tourists, so it can feel a bit touristy. But the views of the mountains from the port are so beautiful you'l hardly notice all the tourist shops. We didn't have our bathing suits, but enjoyed wandering along the port and stopping for THE BEST gin and tonics at the waterfront before dinner. 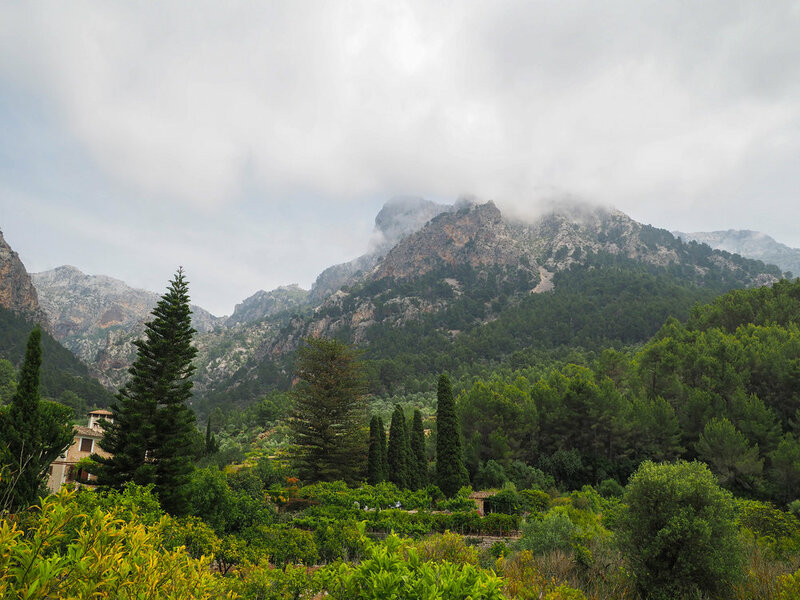 Fornaluxt and Biniaraix are two tiny mountain towns near Soller. There's a couple ways to hike there - I suggest getting off the main road and going on the more mountainous trail that runs through orange orchards and farmhouses. It was closed on the day that we hiked, but if you go, stop at Ecovinyassa, a working orange farm. For our entire hike we kept saying we were going to quit our jobs and become Mallorcan orange farmers! Fornaluxt is a small town, and Biniaraix is tiny, so there aren't any major sites, but just enjoy wandering around and getting lost in the narrow, windy roads. 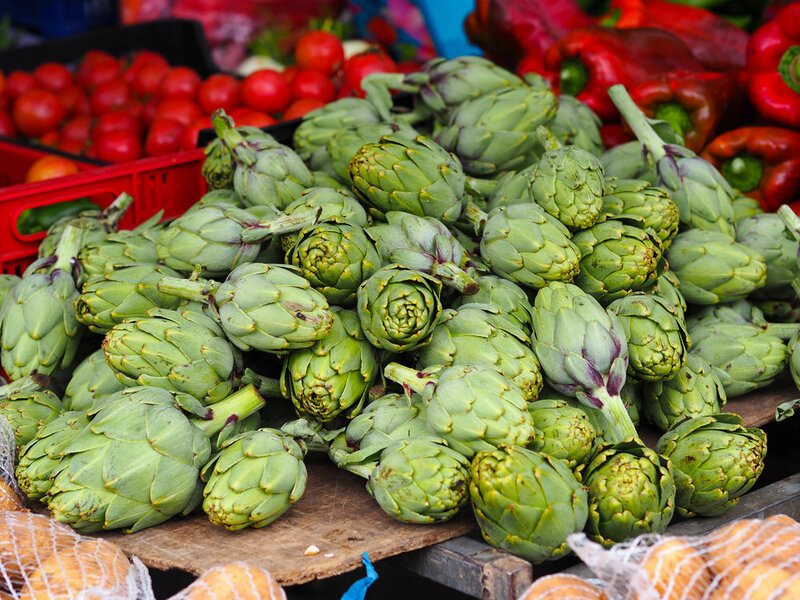 Saturday is market day in Soller. All the streets around the main city square are jam packed with tents selling fresh produce, local cheeses and ham, jewelry and other handicrafts. We picked up soaps made with local olive oil and oranges and lemons from the soapmakers yard, plus the most incredible jams and chutneys - more local citrus blended with ingredients like eggplant, chickpeas, raisins, and carrot. Where to stay: We stayed at Hotel S´Ardeviu, a beautiful old home in a narrow alleyway just off the main city center. It has all it's old historical details preserved and a gorgeous garden out back where you can enjoy breakfast (more cheeses, crusty breads, local sausages, soft boiled eggs, aforementioned yummy jams, and seasonal fruit - again, all the things that make me happy). 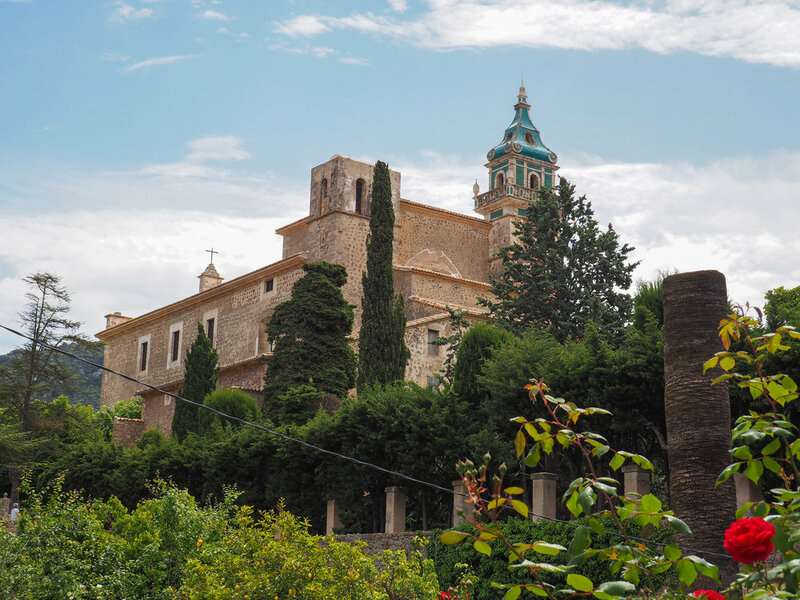 One of the days we were in Palma, we took the bus to the town of Valldemossa, a pretty little mountain village famous for it's monastery, La Cartuja. La Cartuja was originally a palace built in the 1300s that was turned into a monastery not too long after. When the monks were expelled in the 1800s, it became a charterhouse where some famous people stayed, including the composer Fredric Chopin and his partner, the author George Sand. I couldn't get over the courtyard gardens, bursting with flowers and fruits, with gorgeous views of the surrounding valley. We spent the rest of our time in Valldemossa eating and wandering the streets, enjoying all the viewpoints of the valley. 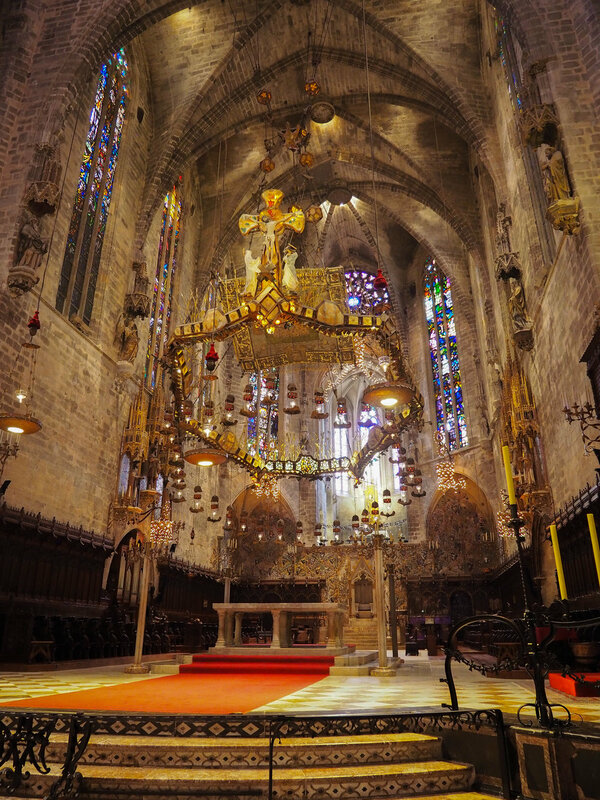 We also visited Església de Sant Bartomeu, a church on the other side of town, and Casa Natal de Santa Catalina Thomàs, the birthplace of the towns saint. I looooved Deia! 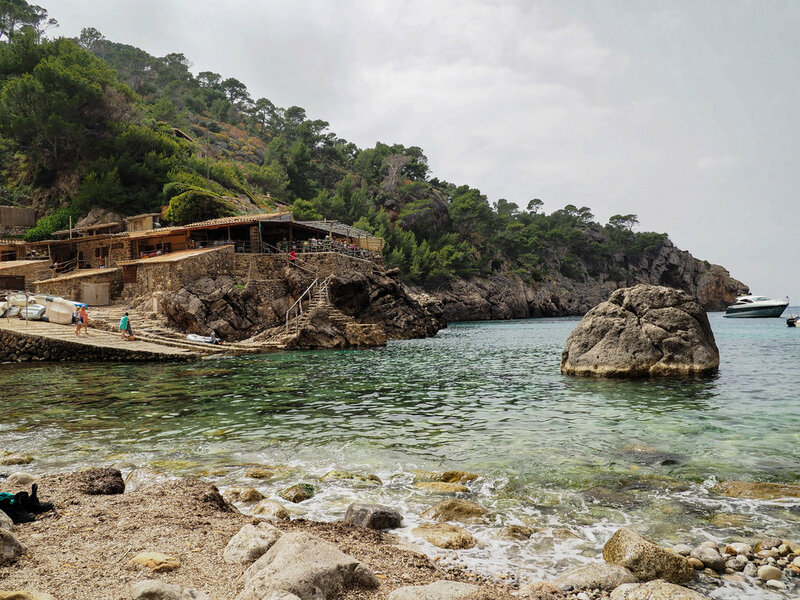 We took a day trip here from Soller and spent the day wandering town, hiking to the beach, and (of course) eating. 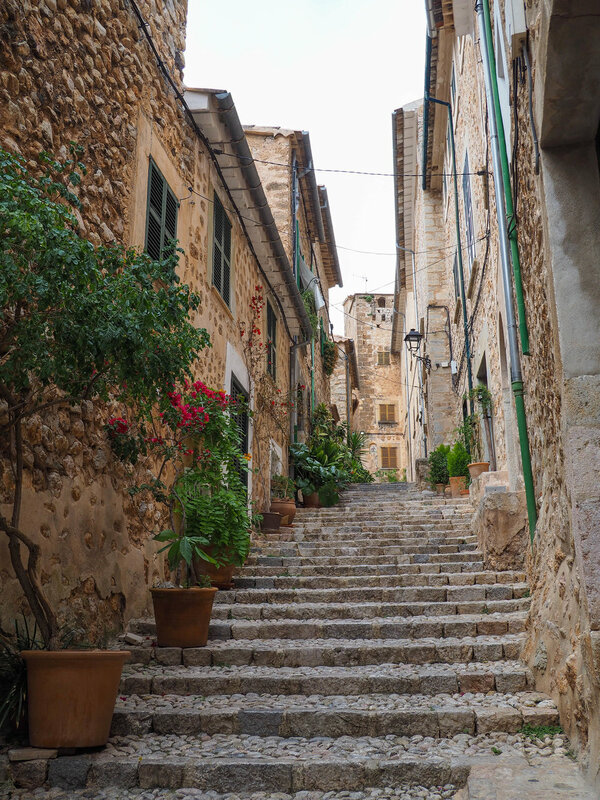 Deia is a UNESCO world heritage site, a pretty little town of honey yellow stone houses on a hillside in the Tramuntana mountains that overlooks the ocean. It's a hub for artists, creatives and rich people who can afford the gorgeous homes. After spending the morning wandering around town, we hiked down to the rocky beach, Cala Deia. The hike down is a little rough, but we (barely!) made it in sandals! Cala Deia is a rocky little beach in a cove with a couple beach shack restaurants basically built into the side of the cliff. One is Ca's Patro March, where the kidnapping scene in the Night Manager was filmed (if you haven't seen it, all I have to say is Tom Hiddleston in well tailored suits). Unfortunately we were there on a Sunday when a lot of things were closed, so if you make it there, also hit up Robert Graves house, the home of a famous Mallorcan poet. We were also sad to not have time for a cocktail at Belmond La Residencia hotel, a Richard Branson owned hotel where there's a beautiful art gallery and garden. One of the days we were in Soller we hired a private driver (highly recommend Gina with Tours by Locals - she was fantastic!) to take us through the countryside. 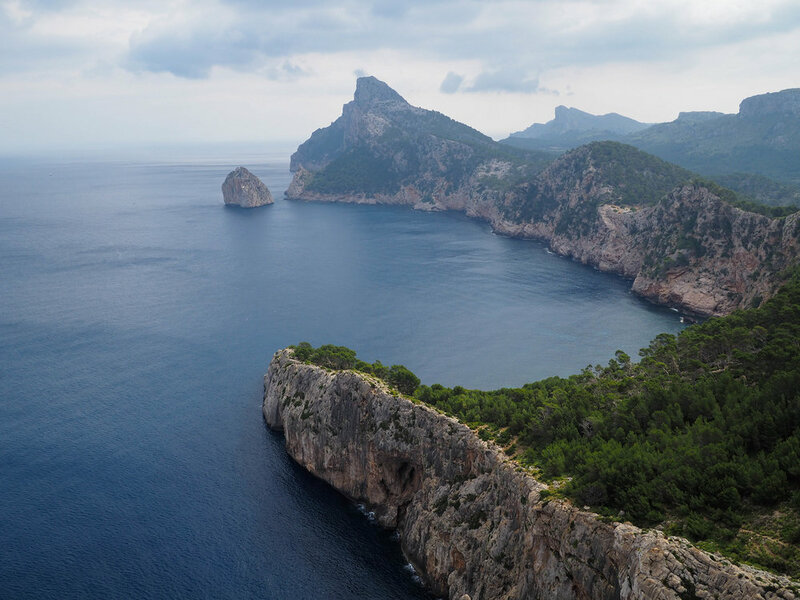 We drove through the mountains to Cap de Formentor, the northernmost peninsula, a narrow, rocky strip of land that juts out into the Mediterranean. The main viewpoint is PACKED with tourists, but the view is incredible and definitely worth battling the crowd. 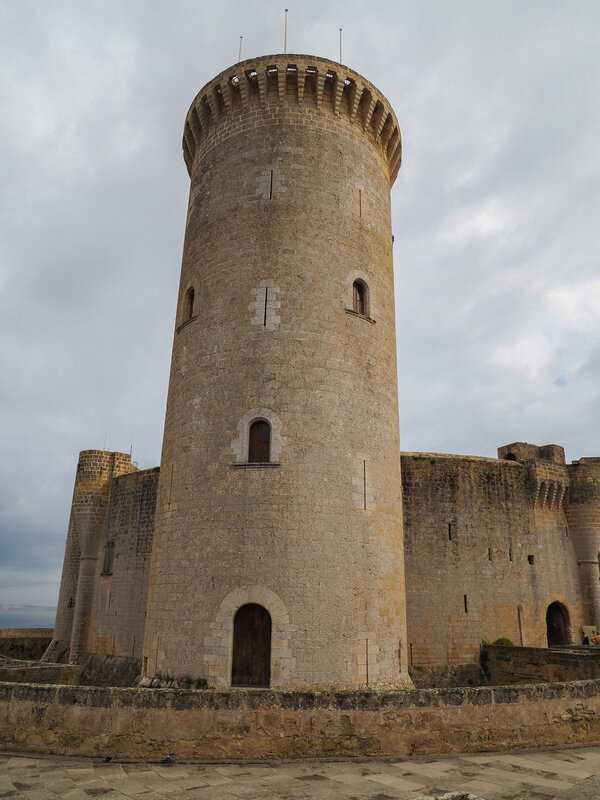 You can drive out onto the peninsula to visit an old lighthouse, but Gina recommended going up to the Talaia d'Albercutx, a 15C tower built to protect against pirates. It's much more secluded and offers the most incredible views of the peninsula, the luxury 1920s Formentor hotel, Pollenca Bay and port, and La Fortaleza, the insane mansion that's Hugh Laurie's characters home on The Night Manager (seriously guys, you need to binge watch it ASAP). 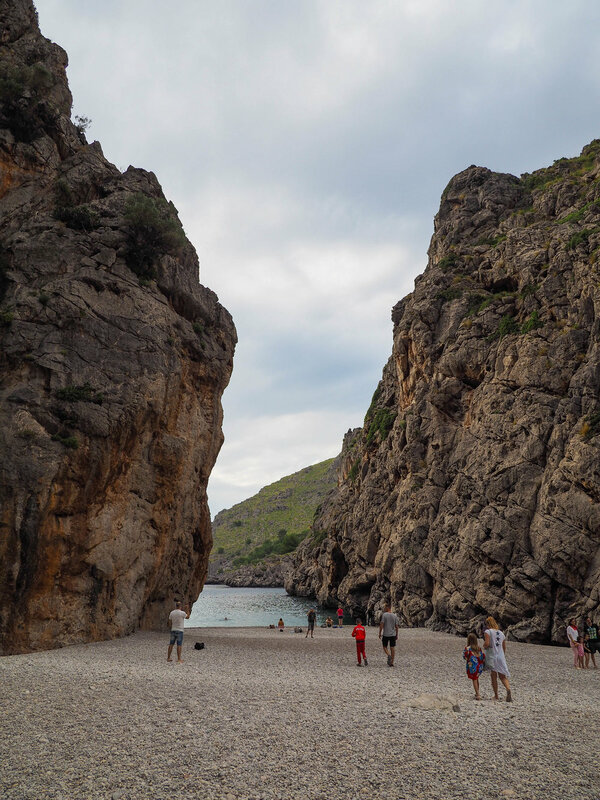 Sa Calobra is a narrow, hairpin-turn filled road that takes you through the Tramuntana mountains to a couple beautiful rocky beaches. If you're driving it yourself, be sure to go after 3 pm, when all the tourist busses have to be off the road. The hairpin turns and steep dropoffs weren't as bad as the books made them out to be, but with a tourbus speeding at your around a turn, that's another story. The drive down had the most incredible views, so if you can get a driver so you can really enjoy the ride, do it. Going later was also nice because the beaches were much quieter. Highly recommend packing a picnic and rose (none for the driver though, obvs). The first beach at the bottom is a small beach in a pretty little cove surrounded by restaurants and fishing shacks. Keep going and take the path to Torrent de Pareis, which is spectacular. The path there takes you through a couple caves which eventually opens up to a river gorge that runs through the mountains and opens up into a tiny beach flanked by massive rock cliffs. I was very jealous of the people relaxing on their sailboats in the bay! When we were in Mallorca, we talked to a ton of British tourists who came to the island again and again. I never quite understood coming back to the same place for vacation - there's too much of the world to see! But I kind of get it with Mallorca. It's one of those places I wouldn't mind lingering and relaxing a bit longer - I actually think it would be a great honeymoon destination for those who want some time to relax, but don't want to hang out at a resort the whole time. Next week I'll be sharing my favorite places to eat in Mallorca! Get ready for some tapas!